All aboard for the ride of your life. Every 7 years the Japanese celebrate the Onabashira Festival. Onabashira is considered one of Japan’s three most unique festivals. It has been held every 7 years at Suwa Taisha Shrine for the past 1200 years. During Onbashira, 4 huge logs, the largest measuring 16 meters long, 1 meter wide and weighing 10 tons, are cut in the mountains and brought by hand to the shrine. The people guiding the logs sing Kiyariuta as they go and when they reach the shrine they plant the logs upright in the ground, one at each corner of the shrine. It is believed that the place gets spiritually renewed by the raising of these natural pillars, as divinities are supposed to dwell in the trees. 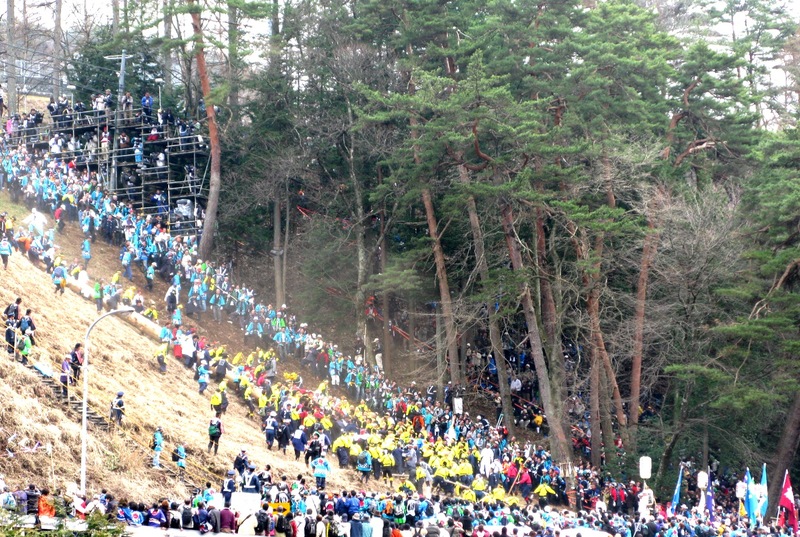 Kiotoshi, the sliding of the logs down the hill and kawagoshi, their crossing over the river are highlights of the festival. Madness prevails as the locals attempt to ride the logs down the hill. With 50 thousand people urging them on, the chosen few will sit on the log as it teeters over the edge as an even larger group pull with massive ropes to get the thing moving. Injuries and even deaths are quite common. I sat back in the crowd of excited onlookers in the stadium, willing the log to slide and praying it doesn’t turn and roll down the hill instead. There are lots of festivals in Japan throughout the year and it is a good idea to coincide your trip to Hakuba with a truly cultural experience. This entry was posted in White Horse Hotel and tagged accommodation, Hakuba, Japan, Nagano hotels, skijapan. Bookmark the permalink.